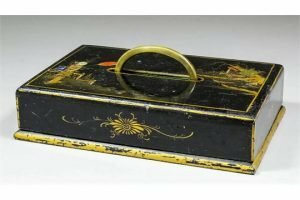 An early 20th Century European black lacquered gaming counter box, the exterior decorated with a standing figure in a landscape, with brass carrying handle, the interior with a set of coloured gaming counters housed in ten divisions. 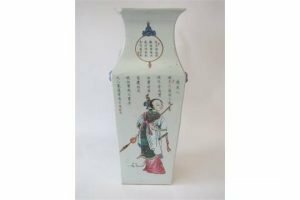 A Chinese square shaped vase, with everted rim decorated with a warrior and other figures beneath script. 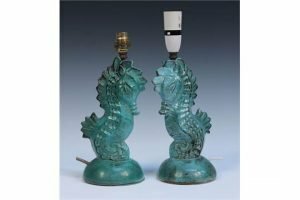 A pair of mid-20th Century turquoise glazed ceramic table lamps in the form of stylised seahorses, raised on circular bases. 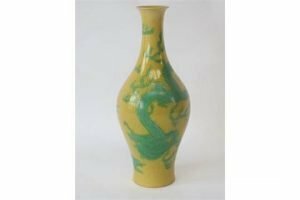 A Chinese narrow necked yellow baluster vase with incised green dragon decoration. Six character mark to base. 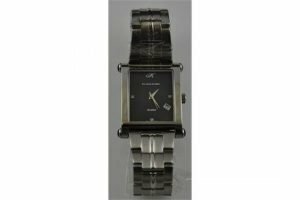 A Klaus-Kobec Valiant gentleman’s stainless steel wristwatch, the rectangular charcoal dial with date aperture cased with faux sapphire lugs. 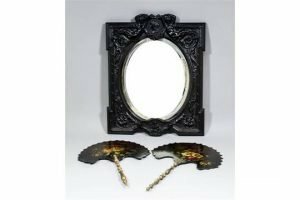 A late 19th Century pressed composition framed rectangular dressing table mirror, the pressed detail with two female classical figures supporting a profile bust of a classical lady, cornucopia, leaf and scroll ornament and a putto, the inset with bevelled oval mirror, with a pair of similar 19th Century black papier-mache face screens of shaped outline, painted with a peacock and flowers. 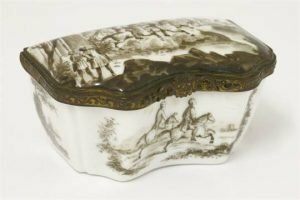 A German porcelain gilt metal-mounted snuff box, by Eckert & Co, painted in sepia with hunting scenes, underglaze blue cross swords. 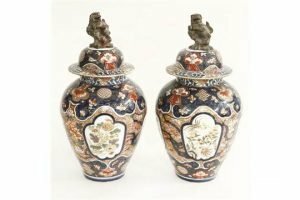 A decorative pair of Paris ‘Arita Imari’ Vases and Covers, each baluster body enamelled and gilt with panels of flowers and ho on a ground of peony and gilding, the shoulders with collars of flowers, all in typical palette of underglaze blue, red and gilding, the domed covers with shi shi knop. 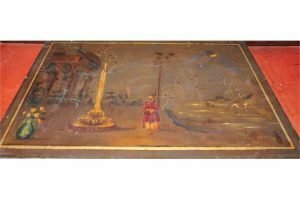 An early 19th Century painted slate panel, decorated with pheasant and a figure within a Chinoiserie garden. 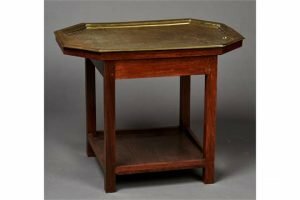 A 19th Century Indian brass canted rectangular tray, engraved with a profusion of animals and figures, raised on a hardwood table base. 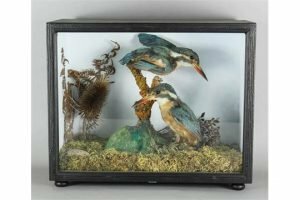 Two Kingfishers contained in naturalistic setting and within ebonized and glazed display case. 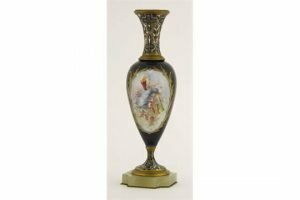 A French porcelain champlevé mounted Vase, the pear body midnight blue and painted in Sèvres style, gilt-edged panels of a floral cupid or back pipes, signed Rouchette, the mouth and foot with enamelled stylised decoration, on an onyx base. 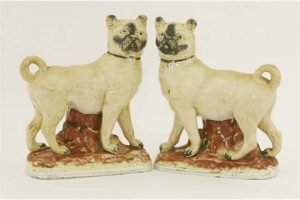 A pair of Staffordshire pottery Mastiff Dogs, c.1880, each strongly modelled with ochre tinged body, on bright maroon base, the muzzle details in black. 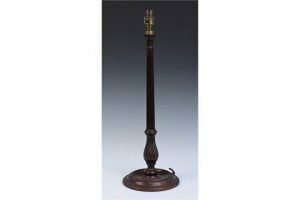 An early 20th Century George III style mahogany table lamp, the fluted and spiral reeded stem on a circular base. 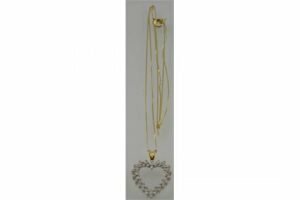 A 14 carat yellow gold diamond heart pendant of approx. 1 carat, on a fine 9 carat yellow gold chain. 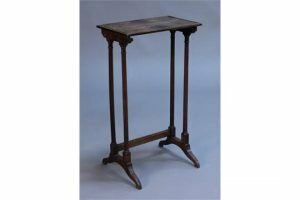 A Regency mahogany nest table, the rectangular top above turned legs and bracket supports. 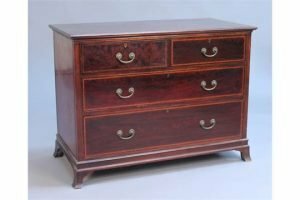 An Edwardian mahogany chest of two short and two long drawers, on splayed bracket feet. 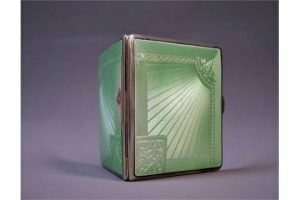 An Art-Deco hallmarked-silver and enamelled compact. Birmingham assay, 1932. 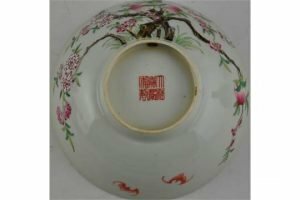 A Chinese famille rose pattern bowl decorated with bats and peach trees, bears a six character Jiaqing mark to base. 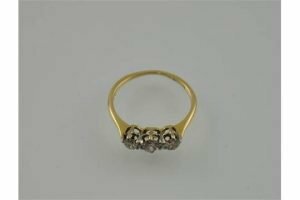 A late Victorian old cut graduated diamond 3 stone ring, claw set in an 18 carat yellow gold band.